You can learn a thing or two about a country by visiting its busiest airport. For example, the Atlanta airport may say about America that our connections with each other are becoming more distant, and it has become harder to make them. But if we fail, we can always count on a nearby Sbarro. In 1992, my uncle and I passed through the main airport in Johannesburg on our way to visit my brother in Botswana. Apartheid in South Africa was in its death throes; the first universal vote was two years away. The country still seemed shut off from the rest of the world. 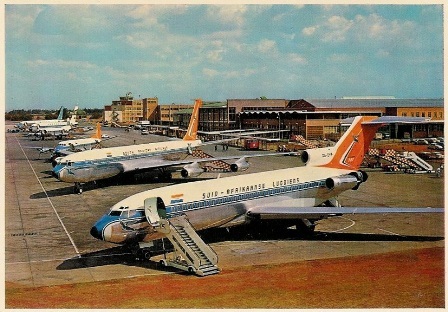 Our flight on South African Airways landed at dawn, and our connecting flight to Gaborone, Botswana wouldn’t leave until mid-afternoon. We had the better part of a day to waste at the airport, which was then named for Jan Smuts, a British colonial who had served as South Africa’s prime minister in the thirties and forties. Smuts was a segregationist. I’ve been to airports in remote places like Honduras, Nicaragua, Mazatlan, Zambia and Orange County, but the Jan Smuts airport was the worst. A three-story concrete block building, it was the backwater of backwater airports. An oleo of travelers from the Southern Hemisphere’s diaspora occupied all the seats in the small departure lounge on the first floor. There were few signs explaining where we could go for a little more space to begin our eight-hour wait. No one seemed helpful. After a little searching, Uncle Royce and I found an empty lounge on the third floor furnished with ratty, overstuffed couches and chairs. It looked like a college dormitory lounge in the seventies. Except for a few vending machines, there were no cafes or other concessions except in the ground-level departure lounge. I was afraid to use the bathroom. People in that part of the world apparently did not relieve themselves the same way Americans did. At Jan Smuts, it involved standing over a metal grate. I still can’t get my mind around it. The only thing that worked well at the airport was the PA system, which repeatedly blared updates on departure times, first in Afrikaans and then in English. I can still hear that woman’s voice: South African Airways flight 232 to Bulawayo has been delayed… Zimbabwe. Now there was a country on the move. Robert Mugabe and his revolutionaries had vanquished the Rhodesians more than a decade earlier, and Zimbabwe was going places. South Africa could learn a thing or two from Zimbabwe, I thought. Two years later, Nelson Mandela became president of South Africa. During his presidency, his country made the relatively peaceful move from apartheid to universal democracy in which citizens of all colors had a say in their country’s future. More important, Mandela initiated a national reconciliation in which whites and blacks together would move the country forward. Fifteen years after my first visit, my family and I returned to see my brother and his wife. We again had to go through the Johannesburg airport. It is now called O.R. Tambo International Airport, named after an anti-apartheid leader, and it feels like a real international airport. Escalators? It has them. 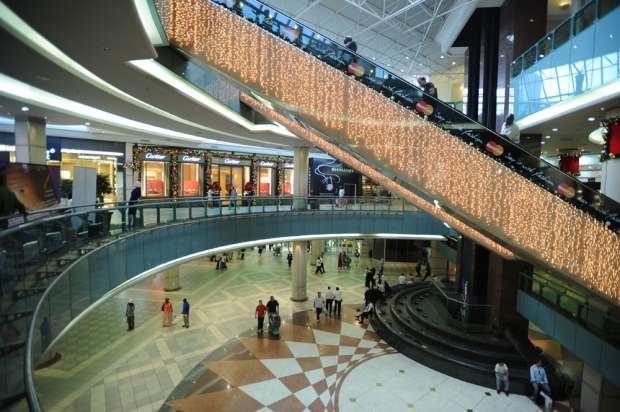 A shopping mall with overpriced trinkets? You bet. Best of all, some of the cleanest, nicest bathrooms in the world. The best hand driers, too. South Africa hosted the 2010 World Cup. When my family was there three years earlier, the city seemed to buzz with anticipation. Everywhere around the airport, workers were putting up high-rise hotels. Everyone was busy. People seemed happy. At the airport. I repeat, people (excluding customs officials who must scowl) seemed genuinely happy at the airport. Nelson Mandela doesn’t deserve all the credit for that. As far as I know, he never worked as a skycap. But the difference in atmosphere in that one little area of South Africa had changed dramatically. A strong leader who “gets it,” one who understands that one group can’t progress if another group gets left behind, can have a great impact. Look at Zimbabwe now. Robert Mugabe has turned that country into a backwater, because he chose to put the few ahead of the many. Mostly, he has put himself ahead of everyone. When someone asks me that clichéd question about what three people I would like to have dinner with, I would first choose the two pickiest eaters I know so there would be more food for me. Then I would pick Nelson Mandela. I would like to know how he became so much wiser than just about everyone else. We could use a lot more Mandelas. Very interesting perspective that I would have never known. Thanks for sharing.